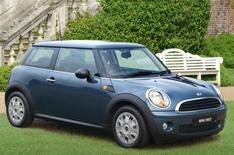 Cut-price Mini on sale | What Car? Buy a new Mini for under 11,000 with the launch of the Mini First. For 10,950, you can own the new entry-level Mini powered by a 1.4-litre petrol engine mated to a six-speed manual gearbox. It's the same engine that's in the Mini one, but detuned to 73bhp. Its 0-62mph in 13.2 seconds and top speed of 109mph isn't the fastest, but carbon dioxide emissions and fuel consumption are low, thanks to fuel-saving technologies such as an engine stop-start system, brake energy regeneration and a gearshift indicator. As you'd expect from an entry-level model, the First isn't brimming with kit. Stability control and traction control, six airbags, alarm and immobiliser tick the safety and security boxes. However you'll pay extra for the likes of air-conditioning and alloy wheels.